This collection of letters and other documents offers the most complete portrait of the relationship between two of the American South’s most acclaimed 20th-century writers: Flannery O’Connor and Caroline Gordon. Gordon (1895–1981) had herself been a protege of an important novelist, Ford Madox Ford, before publishing nine novels and three short story collections of her own, most notably, The Forest of the South and Old Red and Other Stories, and she would offer insights and friendship to O’Connor during almost all of O’Connor’s career. 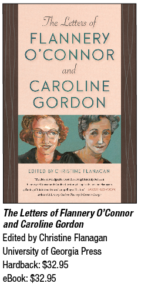 As revealed in this collection of correspondence, Gordon’s 13-year friendship with O’Connor (1925–1964) and the critiques of O’Connor’s fiction that she wrote during this time not only fostered each writer’s career but also occasioned a remarkable series of letters full of insights about the craft of writing.